Although laminate and water do not go well together, a lot of people still want to have it in areas like kitchens and bathrooms. I have installed a lot of laminate in kitchens and bathrooms, you just have to be careful and pay attention to the water. It may not be a good idea if you have young ones that may spill things on the laminate a lot. My clients are retired and its just the two of them. The product I'm installing is the Quick Step laminate tile. This particular laminate tile is about 16 by 16 inches square. 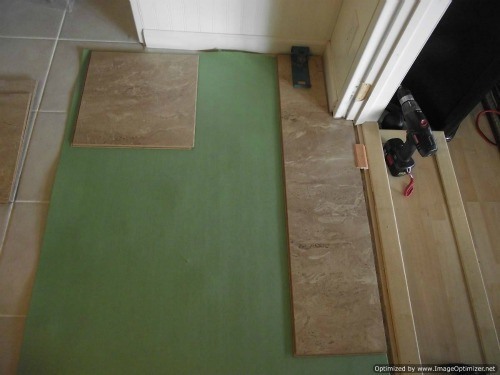 I have worked with Quick Step laminate tile before, so I have a lot of faith in it. It is an excellent product. 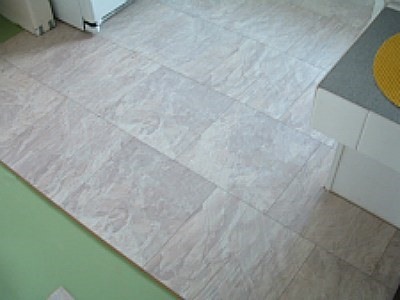 This photo shows the Quick Step Slate tile. It resembles a stone look. The tiles are laid with the stagger joint, which in my opinion adds strength to the floor. The only other option is to install the tiles in a grid pattern where all four corners meet. The job isn't a lot of square footage. This is going to be tedious work. The kitchen has a frig, stove, dishwasher and a washer and dryer. Most of the time I don't remove the appliances from the room. I work up to them and slide them onto the installed laminate. The reason I do it this way, is I don't have to worry about taking appliances to another room and then having to move them all back. Usually I install the laminate just under the front legs of the dishwasher in most cases. The front legs of the dishwasher can be adjusted so the laminate will slide under them. Here is additional information for installing laminate tile. I'll post more to this article as the job progresses. The wood laminate you see here is Pergo, Elegant Expressions. I installed this in 2008, I'm surprised how this laminate still looks like I just installed it yesterday. The laminate tile I'm installing is Quick Step with a marble pattern. I am starting at the entry door. There is a transition here from the work that was done on the step. I need to remove it so I can install one that matches the laminate tile. Getting the first row started is important. With the tile I want to do some measurements and lay out the laminate tile so I don't end up with a small sliver at the other end which will lead into the living room. In the photo below you can see the first row is not the full width of the tile. The other end will be about the same width as the first row of tile. It's more pleasing to look at a bigger tile than a sliver. It is time consuming when installing laminate tile. 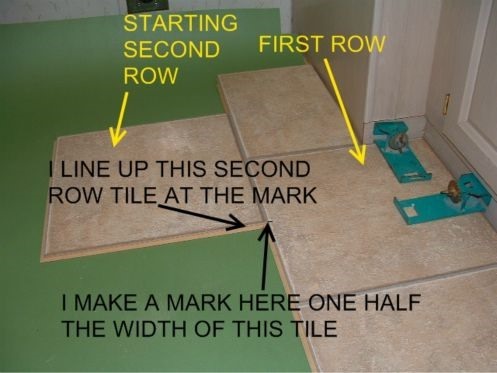 After installing the first row, and beginning the second row you will have to measure the half way point on the first tile installed. The second row will need to start at that mark. 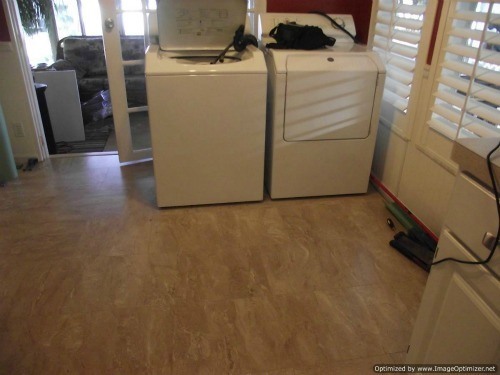 After getting some of the floor installed, I put felt on the legs of the washer and dryer and slide them on to the laminate. I just have to be careful not to hit the edges of the laminate that cold chip it, when I move the washer and dryer up on the laminate tile. Got about half the kitchen done today back to work tomorrow. On this job I had to roll the refrigerator out and then slide it to the side. This allows me to install the tile in the nook where the frig sits. After I get the tile installed, I have to slide the frig back up onto the laminate. Refrigerators only roll forward and backward, not sideways. 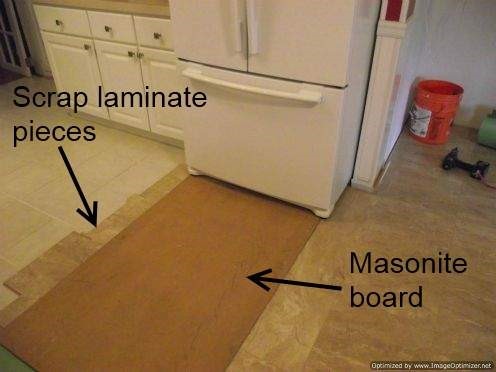 I use a thin piece of masonite board to protect the laminate tile. I place scrap pieces of the laminate tile along the edge of installed laminate. I lock them together along this edge. This protects the edge when I slide the frig up onto the laminate. After I get the frig on the masonite board, I line it up and roll it back into place. A lot of times the ice maker water line is long enough to leave connected to the frig. If I don't have to disconnect the water line there is less to worry about (such as leaks). In the photo above I have the frig back in place. I like to use a masonite type board because it is soft and isn't likely to scratch the laminate tile. Thank you for sharing. 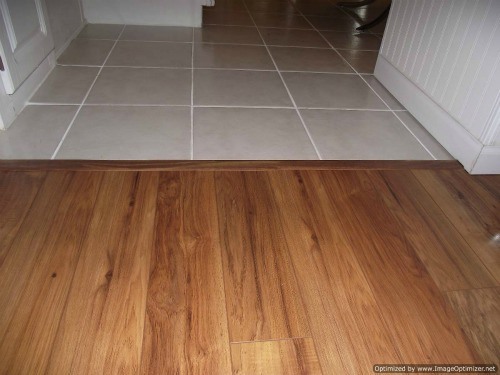 Your floors look great and flawless. Thank you for posting this. I plan on having this exact thing done in my kitchen and laundry area. I cannot deal with the mess of bringing up old tile so a contractor told me about doing it just as you posted. The job you did looks fantastic and i am hoping the mess is minimal. Am installing Pergo Elegant Expressions over ceramic tile in my kitchen. 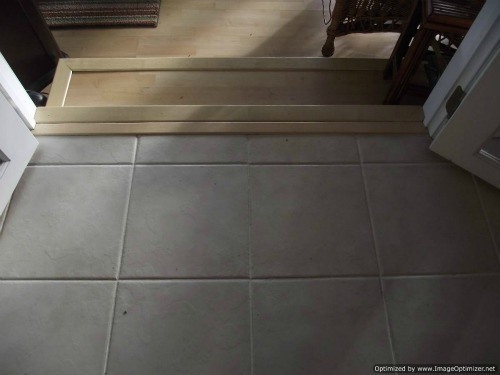 Is it necessary to fill the grout lines in the tile up to level before installing the underlayment?